Specialty Dry Inks help you outshine your competition! Integrating Metallic Dry Inks with your design is simple. You can also draw attention to specific areas of an image or document by applying spot treatments. 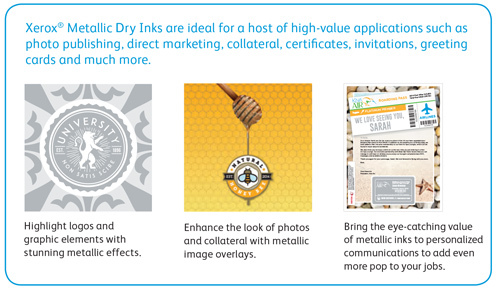 Metallic effects with Xerox® Silver and Gold Metallic Dry Inks are more than digital simulations. They are real metallic inks containing embedded metallic flakes for a stunning, full-metal effect. 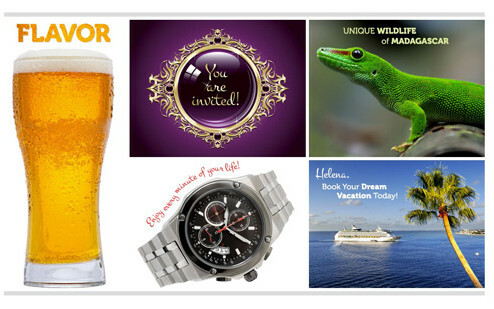 • Incorporating your logo and graphics that have Silver or Gold. • Highlighting headlines, names, and important elements to ensure that they shine. • Simulating or enhancing a metallic appearance in images with a tint overlay. Please view the tutorials below to learn how to prepare your files to take advantage of Island Blue's Metallic Inks. If you have any questions, please feel free to contact Bill at x203.